This title was first published in 2001: Product and particularly customer profitability are black holes in most managers’ understanding of their business. Identifying customer revenue is easy but identifying what they cost - so we can understand whether or not they are profitable - is difficult. In a world in which competition, regulation and the increasing use of the Internet put ever greater pressure on margins it is vitally important to understand both product- and customer-profitability. Activity Based Management (ABM) enables you to do this. This book explains the power of using ABM to increase the profitability of your business. It provides step-by-step guidance on basic principles, comparisons between traditional methods, definitions of processes, activities and cost-drivers as well as details of data collection techniques and implementation steps. 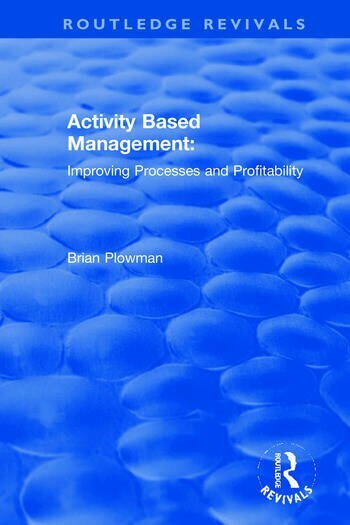 Through the book’s numerous detailed examples a logical picture builds up of how to obtain the benefits that ABM can deliver. On its own ABM will change management decision-making: by showing how ABM also supports other profit improvement initiatives such as Business Process Reengineering, Shareholder Value Added and Customer Relationship Management, managers will learn how they can use the best possible toolkit to put their business firmly on the road to leaps in profitability. Brian Plowman is a Director and founding partner of Develin & Partners, a UK-based management consultancy. Previous industrial experience includes appointments in the UK and mainland Europe, as well as being Managing Director of a group of manufacturing companies. Brian has over 20 years' consulting experience, covering many aspects of corporate transformation. He is co-editor and contributor to Quality Management in the CIMA Professional Handbook series and author of High Value, Low Cost (Financial Times/Pitman). As well as being a regular speaker at conferences he is also a course presenter for CIMA, the ACCA and ICAS.